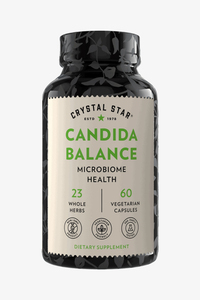 Candida Balance, 60 vegetarian capsules (Crystal Star) - Penn Herb Co. Ltd. 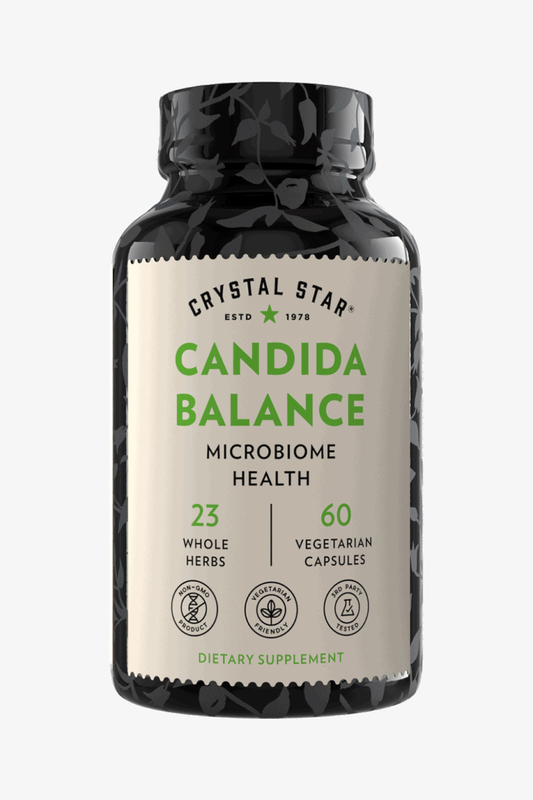 Crystal Star's Candida Balance™ supports the gentle elimination of yeast overgrowth, and can prevent relapses even in stubborn cases. Olive Leaf: premier anti-fungal good body cleanse. Black Walnut Hulls: supports the elimination of candida yeast. Pau D’ Arco: encourages strong immune response. Siberian Eleuthero: supports adrenal response to stress. Olive Leaf (Extract), Siberian Ginseng (Root), Pau D'Arco (Bark), Black Walnut Hulls, White Tea (Leaf), Barberry (Bark), Garlic Bulb Powder, MCT (Oil), Echinacea Purpurea (Root), Amla (Berry), Rhodiola Rosea (Root), Cranberry Juice (Extract), Echinacea Angustifolia (Root), Burdock (Root), Licorice (Root), Dandelion (Root), Fenugreek (Seed), Peppermint (Leaves), Thyme (Leaf), Rosemary (Leaf), Grapefruit Seed (Extract), Spirulina, Bladderwrack Powder, Dulse. OTHER INGREDIENTS: Certified Organic Rice Brown and Vegetarian Capsule (vegetable cellulose and water). Contains Black Walnut Hulls. Supports the gentle elimination of yeast overgrowth,and can prevent relapses even in stubborn cases. Take 2 capsules twice daily for 3 months. Rest 1 month before resuming, if needed. Warning: Do not use if pregnant or nursing. Consult a health care professional prior to consumption if you have any pre-existing medical conditions or are taking any prescription medications.